For Chef Andre Gomez, growing up in Puerto Rico made for many fond memories; visiting his dad and grandfather at the family car dealership, playing volleyball and basketball with friends and hanging out at the local pools and parks. It was the evening gatherings with family that Andre remembers most. The laughter, the aroma of the grill and the glow of the porch light created a safe haven, a community and a place to call home. This is the experience that Andre Gomez wants his customers to feel when they visit his new restaurant: Porch Light Latin Kitchen. Part restaurant, part lunch counter and part Latin Quarter deli, Porch Light is an experience. Like growing up in a large family, the atmosphere is noisy and action packed, lots going on; people talking, laughing, cooks calling out orders, sliced briskets steaming on Cuban bread…the clanging of plates and glass. Underneath the big family atmosphere is Andre’s prowess in the kitchen; a master of smoking meats, Gomez trained with some of Atlanta’s most notable chefs including Kevin Rathbun. It was his grandparents though, cooking authentic Puerto Rican and Argentine dishes in their kitchen that influenced Gomez profoundly. The freshest ingredients from the local market, the island spices and her attention to detail was the spark that ignited Andre’s passion for cooking. To that end, he brings flavors steeped in Spanish and South American culture to a menu that is easy to get excited about. Packed full of street foods, sandwiches, and authentic dishes Porch Light is unpretentious, local craft driven and priced for the average guy. You could say that Porch Light is the new face of the neighborhood hangout. 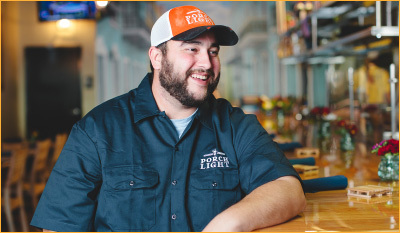 Ethnically inspired to serve a consumer base that is craving more Latin spiced foods, Porch Light combines the adventure of a local dive with an updated, approachable look and feel. Customers will adapt easily to the fast casual service by day and the full service platform during the dinner hour. A lunch counter provides a front and center view of the goings on in the kitchen and creates an intimate connection between the guests and the staff. Not resting on meat alone, Porch Light will feature a nimble assortment of side dishes including street corn, plantains, yucca fries, moles and other eccentric snacks. Proteins, vegetables and fruits will be sourced from local farms. Thirsty guests can choose from curated selection of indie craft beers and small vineyard vino by the glass. Traditional Latin leche’s, (sweetened milk), beverages will be featured in addition to sodas and other fruit drinks native to the Puerto Rican market.